Workman Publishing Company, 9780761187295, 296pp. Imagine a graph with two lines. One indicates happiness, the other tracks how you feel about your body. If you’re like millions of people, the lines do not intersect. But what if they did? This practical, inspirational, and visually lively book shows you how to create a healthier and happier life by treating yourself with compassion rather than shame. It shows the way to a sense of well-being attained by understanding how to love, connect, and care for yourself—and that includes your mind as well as your body. Body Kindness is based on four principles. With mind and body exercises to keep your energy spiraling up and prompts to help you identify what YOU really want and care about, Body Kindness helps you let go of things you can't control and embrace the things you can by finding the workable, daily steps that fit you best. Think of it as the anti-diet book that leads to a more joyful and meaningful life! Rebecca Scritchfield is a well-being coach, registered dietitian nutritionist, and certified health and fitness specialist. 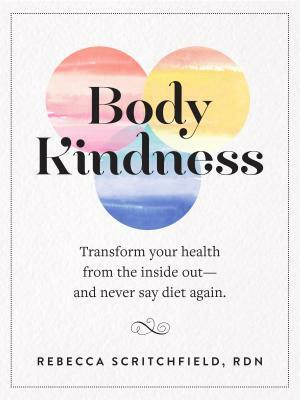 Through her weight-neutral Body Kindness practice, she helps people create a better life with workable, interesting self-care goals. She has influenced millions through her writing, podcast, and appearances in over 100 media outlets including NBC Nightly News, CNN, the Today show, the Washington Post, O Magazine, Health, Shape, and many others. She lives in Washington, DC. “If you are ready to stop torturing yourself with diets and self-criticism and start nourishing your body and mind with healthy choices that help you reach your true potential, consider this wonderful book your road map. Scritchfield provides inspiration and real-life strategies in a fun and friendly style, with lots of helpful graphic tools." "As a firm believer in the power of body positivity, I'm thrilled and impressed by Rebecca Scritchfield's amazing tips for manifesting a joyful, healthy outlook on life, and for honoring the body you have right now."